Champion teams often grow into a tournament with every passing match, and seem to possess an innate ability to get through the opening encounters with minimal exertion and with several aces up their sleeve. While it may be too early to reach any definitive conclusions, if past history and the first two matches are anything to go by, Argentina seems to be finding their way back after a lacklustre year with the promise of a lot of more to come. Spain may have stretched Argentina in their opener, and very nearly gave the Olympic champions a scare but the manner in which German Orozco's side played New Zealand out of the match without breaking into a sweat speaks volumes about the quality of the South Americans. At Rio, Argentina was less than impressive in the pool stages, winning just 2 of their 5 pool matches and finishing behind Germany and the Netherlands but came vigorously to life in the knockouts. At Bhubaneswar, last year, Carlos Retegui's team failed to win a single pool match and seemed to headed downhill when they bucked the trend and ended the HWL as silver-medalists. 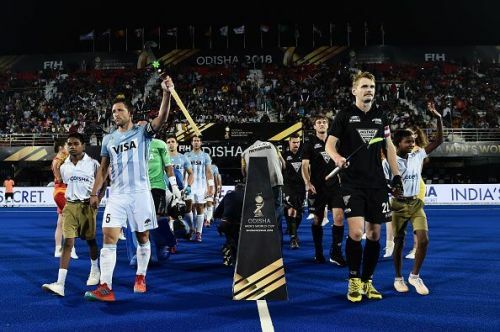 Retegui is not in Bhubaneswar this time around, but Argentina who have struggled at the Azlan Shah Cup and the Champions Trophy earlier this year are beginning to look menacing even before they have begun to fire on all cylinders. Let us take a look at 5 factors that may have been significant in determining the ultimate course of this match. After five years at the helm, coach Carlos Retegui decided to move on, early this year, after having guided Los Leones to unprecedented success. Retegui did return soon after and is part of the Argentine coaching fraternity, but it is German Orozco who has been entrusted with the unenviable task of keeping his nation's flag flying high following the glory of World Cup, Olympic, and Hockey World League success. The former Argentine defender did not have the best of starts as his side ended up third at the Azlan Shah Cup earlier this year, and were beaten by both India and Pakistan in the Champions Trophy at Breda. The South Americans managed a hard-fought win against a determined Spanish side in their opener but a comprehensive and facile win against New Zealand will help to infuse some much-needed confidence in a coach who has to be prepared for tougher battles ahead.